Laser therapy is used to heat the blood vessel to shrink it. Laser therapy is effective for the treatment of very small varicose veins and spider veins. Laser therapy may be used as an additional treatment after sclerotherapy, endovenous procedures, or surgery of larger veins. Laser therapy has emerged as a viable and effective treatment option, especially in patients with needle phobias. Blood in the spider or varicose veins preferentially absorbs laser wavelengths between 800 to 1,100 nm. One such laser is the 1,064 nm Nd:YAG. Using an air cooling system over the skin, laser therapy can be performed with minimal or no significant discomfort. 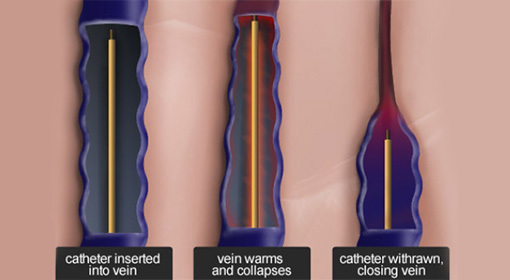 The course of the vein is treated with laser pulses. Laser therapy may require several sessions, spaced at 4 to 6 week intervals, to properly treat the vein. Patients usually will require between 2 and 4 treatment sessions to achieve optimal results. Laser therapy is used to heat the blood vessel to shrink it. Laser therapy is effective for the treatment of very small varicose veins and spider veins. Laser therapy may be used as an additional treatment after sclerotherapy, endovenous procedures, or surgery of larger veins. Laser therapy has emerged as a viable and effective treatment option, especially in patients with needle phobias. Blood in the spider or varicose veins preferentially absorbs laser wavelengths between 800 to 1,100 nm. One such laser is the 1,064 nm Nd:YAG. Using an air cooling system over the skin, laser therapy can be performed with minimal or no significant discomfort. 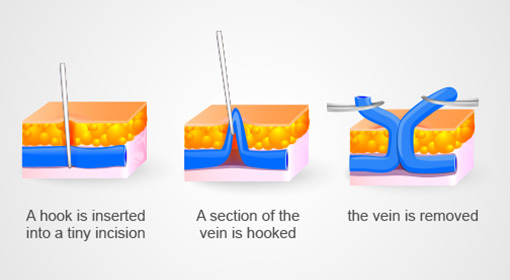 The course of the vein is treated with laser pulses. Laser therapy may require several sessions, spaced at 4 to 6 week intervals, to properly treat the vein. Patients usually will require between 2 and 4 treatment sessions to achieve optimal results. Phlebectomy is a minimally-invasive surgical procedure that removes bulging varicose veins.